An email was sent to Scottish Natural Heritage, challenging them on the "nativeness" argument. The following is the reply sent by Dr Mairi Cole. I have added my responses in between each paragraph. You are correct that there is no datable fossil record for the red squirrel in Britain. This is not unknown for a British mammal as preservation of remains depends on the habitat and soil conditions. Yes, I believe I am correct. Indeed, a large part of our knowledge of some other species is derived from place names or historical references as to how the animals were used for food or clothing. Sorry, but this is irrelevant, as we are not discussing "other species". We're discussing whether the Red Squirrel is a native species and whether you have proof of its continued existence in this country since 10,000 years BP (before present). It seems you don't. However, despite this lack of fossil evidence, the Handbook of British Mammals (the definitive guide to our fauna) states that there is "no reason to doubt that red squirrel is native in Britain". This is not evidence that the Red Squirrel is a "native species". This is an assumption. It suggests the nonsensical concept that all mammals should be regarded native if it suits the purpose of conservationists, unless proved otherwise. You are also correct that the population of squirrels has fluctuated historically. Whilst this can be partially attributed to deforestation, it is also known that they were hunted heavily by 'Squirrel Clubs' in some parts of the country. Whilst the impacts of these activities was offset by re-stocking from elsewhere in the UK and the Continent, introduction of the grey squirrel from North America introduced a niche competitor which upset the ecological balance. The subsequent decline in the red squirrel range has mirrored the expansion in grey squirrel range across the UK. Again, I believe I'm correct. But your historical period only relates to the 19th and 20th centuries. Absent evidence to the contrary the red squirrel is not a native species, and could well have been introduced by man from Continental Europe within the last couple of thousand years. How do you know it wasn't? There seems no evidence that the Red Squirrel was ever a native species of Scotland. The extent to which grey squirrel has replaced the red squirrel in the UK is fully recognised by conservationists. But why should we be victimised for our success? The very conservationists you mention are the ones who are planting millions of "native" trees that suit our needs and caring little for the requirements of our friends the Red Squirrels except in some rare cases. You cannot expect us not to take advantage of your generosity. Given this, and the robustness of their population, it is also fully acknowledged that eradication is not an option. Why should we not enjoy a robust and healthy population; all populations strive for this. I would certainly hope that eradication is not an option. But it has been suggested by politicians that it could be, with a price put on our heads - or rather tails, which the killers would cut off to present for their bounty payments. This attitude against us is similar in principle to the racial prejudice you have among your own species that has resulted in millions of your individuals being slaughtered. Under these circumstances, it is our aim to seek a balance between red and grey squirrel occupancy which does not undermine the conservation of our native species. Sounds innocuous, but in reality it's probably not. This is done through targetting control measures at areas posing greatest risk to the red squirrel. In practice this involves identifying defendable stronghold areas for the native species around which grey squirrel control can be targetted. Shooting us where and when the opportunity arises. Poisoning us with Warfarin, which can result in a slow and dreadful death that can take days, and which can also affect non-target species. Trapping us in cages and bludgeoning us to death in a sack when we are given the false opportunity to escape. What have we done to your population to deserve this despicable treatment? And why do you use euphemistic language? Are you too ashamed of what you do, to tell it how it is? 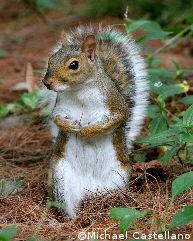 This includes areas in which grey squirrels are identified as carrying the Squirrelpox virus - a disease to which they have a natural immunity but is fatal to red squirrels. You cannot identify those of us who are carrying the pox virus, so you are indiscriminately killing many of us that do not carry the virus. The reason we have immunity is our population was once also infected and those of us who survived went forward with immunity in the form of antibodies that protects us. The same natural process is currently happening to the red population as Reds have recently been found with antibodies. You make it sound as if all greys are carriers; this is patently not the case as reds and greys have been known to live together for many years without any harmful effects. The idea put forward that we are a pox-ridden population is simply not true and is pure propaganda. A combination of these approaches ensures the greatest gain for red squirrel conservation at minimal grey squirrel control costs. Not if you're on the receiving end of a shotgun, poison or a blunt instrument. As you will appreciate, many people living in areas with red squirrels have an affinity with the species and wish to do what they can to retain it for the future. Similarly, we understand the affinity many people have with grey squirrels in areas where these have replaced red squirrels. However their impact on red squirrels is indisputable. Under these circumstances, we are working to establish an ecological balance between the species. What I appreciate is that you have little or no proof that the Red Squirrel is a "native species". What I appreciate is that we are being persecuted because of the ethnic origin of our ancestors and the colour of our fur. We have lived in this country for around forty-five generations. What humans can trace their ancestry back that far? What I appreciate is that we may not be as pretty and cute as the Red Squirrel and do not have the same marketability as tourist attractions but we are flesh and blood and feel pain and terror just the same as other sentient mammals. What I appreciate we have in common with Red Squirrels is we have both been called "tree rats" by those who despise us and have suffered huge losses at the hands of humans. What I appreciate is we are a parallel population to humans and deserve to be treated with respect and allowed the freedom to live our lives without fear and persecution. Finally, what I appreciate is that the lives of any squirrels, red or grey, should not depend on the whim-like affinities of members of the human population. I hope my response has made you understand that our lives are just as important to us, as yours is to you.